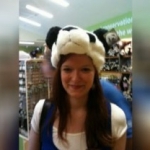 Meghan O'Keefe is a comedian and writer who lives in New York and likes pandas. Her day job is blogging about celebrities for VH1.com and her secret dream is to play Cordelia opposite any British actor whose name starts with "Sir." Follow her on Twitter & Tumblr! She also blogs at My Mom Watches Game of Thrones. Seth MacFarlane's Oscars: Hilarious or Hurtful? Who's Still in the Running To Be The Vatican's Next (Top) Pope? Hacktivism: Hacking for Good or Cyberbullying for Evil?